As a beginning teacher at Gunn High School in Palo Alto, I was only focused on taking care of my students within the walls of my classroom. I didn’t realize the wealth of resources that were just outside our campus at Stanford, and just a little further afield in San Francisco. As I got settled there as a teacher and began to see what was around us, I contacted world class US History professors David Kennedy, Carl Degler and Clayborne Carson. Kennedy and Degler came and talked to my students while Carson allowed me to sit in on his lecture on Malcolm X. I began to take my psychology students to the Exploratorium in San Francisco. I loved it and my students loved it. From these interactions, I got better as a teacher and my classes got better, too. We were able to talk to people and see things that shook up our normal day-to-day classroom routine. My family and I moved to the mountains, and once again, I needed to find a way to break down my new classroom’s walls. 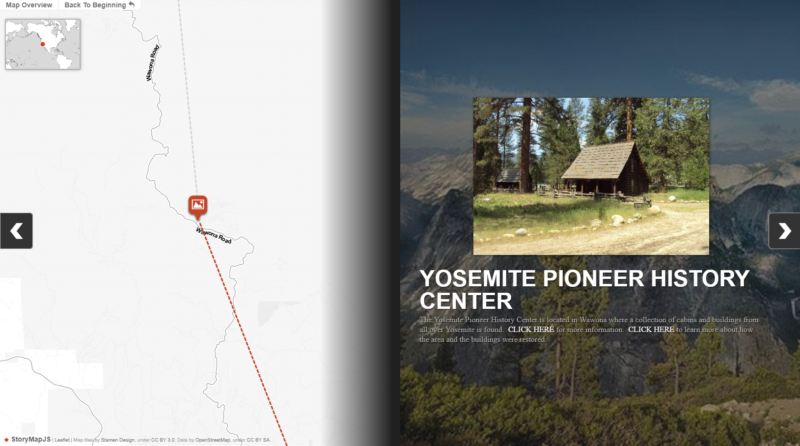 Now our resources are Yosemite National Park and the history of the Sierra Nevada foothills. I found a way to highlight the history and culture of our local area and do it in one day! My US History students and I leave before 9am and try to get back for sports practices at 4pm. We are often late, but we always get back by 5pm at the very latest. We travel about 165 miles in over four hours in the car. In between we make a bunch of stops to explore Native, Settler and Gold Rush histories and cultures. We even take time for lunch! Now I can share our journey with the parents who are accompanying us on the trip, but driving in their own cars. I can give my principal a detailed itinerary. We’re good to go! However, what about the kids who can’t go? What about the teachers who live too far away, or don’t have the money or other resources to make one of these types of trips? That’s where StoryMapJS comes in handy. If you haven’t worked with StoryMapJS, you need to! It’s a really robust platform that allows maps to become truly interactive and multimedia. Visuals can be added for each stop on the map. Links can be added to text descriptions. They are easy for both teachers and students to make and use. Here are links to a quick video tutorial and a text tutorial from the Gilder Lehrman Institute. The platform is great, the maps are easy to make and the finished map is fun to use! Every year, I have some students who can’t participate in the field trip. I had always talked about creating a resource for our students to be able to get some of the benefits even if they couldn’t go. I also realized that we could have a mobile resource for the students who were on the trip to use as a guide. So, now that we have our map, what do we do with it? First off, every stop has a visual and a basic description that explains why we would want to stop there. There are also links for each stop on the map to give our users a broader understanding of the significance of the site. For students on the trip, there are a number of activities I use to help deeply engage them along the way. The easiest is to have them take photos on their phones and then use their Notes App to record what they have learned at each stop. It’s basically a digital log of their impressions. When they get home, they can build their own version of the StoryMap with their own photos and information. We also use the map to have a rolling Socratic discussion. I have had the students read up on the next stop as we are in transit, then develop questions on the issues we will be dealing with before we stop. I ask them about the site’s significance and they use the transit time to discuss their different perspectives on the questions and issues before we get to our destination. I also like the idea of creating interactive virtual field trips for students and teachers who cannot make the trip themselves. They can use our maps as guides to their own projects or their own discussions and activities. For the students back at school, they can use the map to create a presentation to allow them to get a visual and textual sense of what we did on our journey. 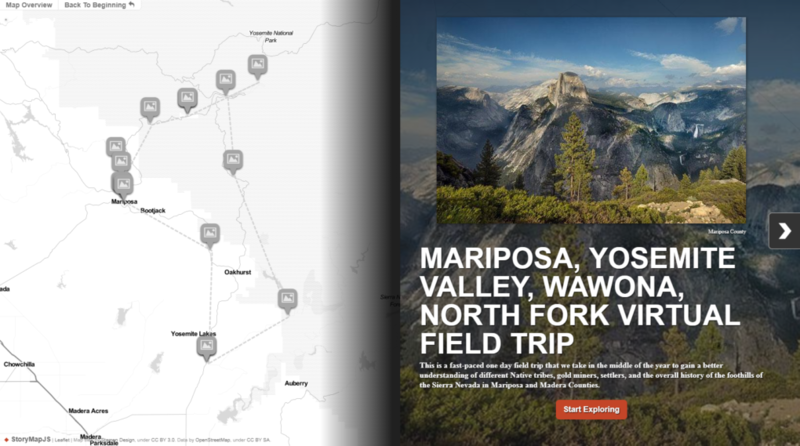 I have had students create quick Google Slides presentation for the stops at the Mariposa Museum, the Yosemite Museum, the Wawona History Center and the North Fork Mono Museum. I also have them compare the cultural significance of the Wassama Roundhouse and St. Joseph’s Catholic Church. I also have them explain why the Mariposa Courthouse is still in use while the Mariposa Jail is not. Through this project they will be better prepared to join in the discussion when we debrief our experiences back at school. They can be active participants in gaining deeper understandings of what we gained during our day away. Using StoryMaps helps me break down the walls of my classroom, and have fun doing it. Museums, historical sites, parks and universities are all great resources to tap into, and interactive maps can help guide the journey into the local community. I hope our trip and our maps inspire other teachers to take advantage of their local resources! If you want to learn more about how to make interactive maps in your classroom, take our free, online course Making Interactive Maps on KQED Teach. Thank you for this very inspirational post. It’s resulted in my planning to invite my 11th grade US History students, second semester, to use StoryMapJS to map out various historical sites in the LA area. 1. Where one can go in LA to find evidence of the Spanish attempt to colonize the new world. 2. Where one can go in LA to find evidence of things built by the WPA during the Great Depression. 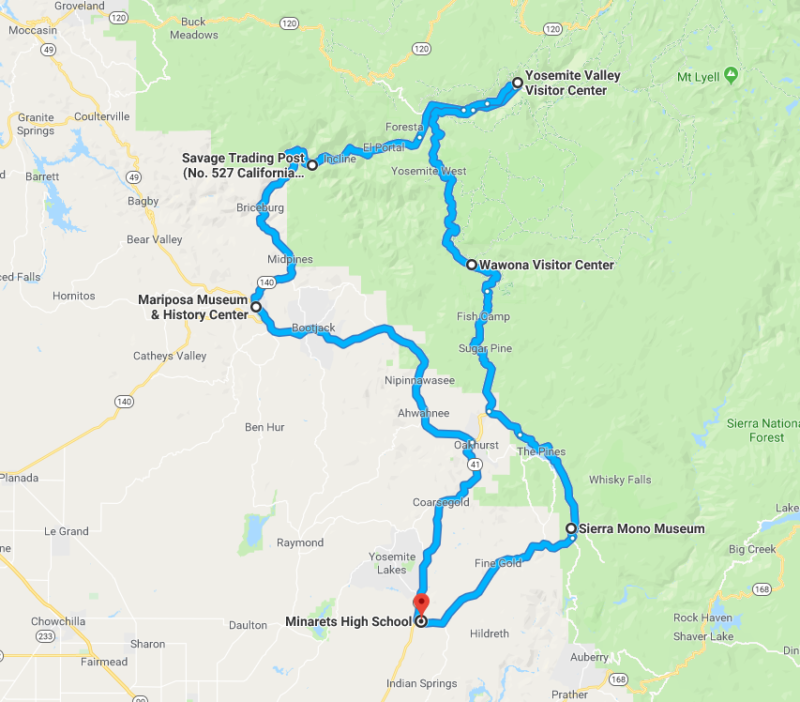 Bob Kelly teaches U.S. History, Government, Economics, and Psychology at Minarets High School outside Yosemite National Park in the Sierra Nevada foothills of California. Bob has taught for over 20 years in all sorts of social studies content areas and school settings including Palo Alto, Mariposa, and the Central Valley. He loves blending new and old school understandings and approaches to the world we live in. He is a well-experienced teacher trainer in both history and technology integration and has been an AP reader for the U.S. History exam as well as a AP US History consultant for the College Board, a Google Apps for Education Certified Innovator, and a PBS LearningMedia Local Digital Innovator. Bob was also a football coach for over 25 years.